For some of you, setting personal-finance goals is easy. This seems to be the case especially for personal-finance bloggers. I guess personal-finance blogs were “born” in many ways from goal setting—people announcing a personal-finance goal (often relating to net worth or debt reduction) and chronicling their progress in a public forum to keep themselves accountable and on track. For some of us, it’s not so easy. We’re not quite sure where to begin, let alone where we should be trying to end up. Some of the ways to set goals seem to involve a lot of work and a lot of math. Both of which are immediate disincentives. I actually think all of these approaches are fantastic and highly recommend them. Unless you just can’t bring yourself to execute on them. If you’ve been planning to adopt one or more of these approaches and it always seems to sit at the bottom of your “to-do” list, perhaps something else is in order. 1. Do Something—Anything! If you are really just getting started in getting your personal-finance house in order, I think it’s most important that you just do something. So set any goal. Pay down some debt this month—any amount! Save some this month—any amount! Sign up for your company’s retirement plan, if you haven’t! 2. 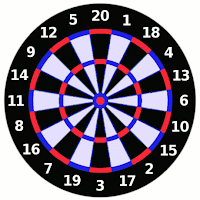 Throw Darts. Similarly, if you are in the early stages, I think the underlying accuracy and precision of your goals is less important. If you have no emergency fund, pick a number, any number. How about $1,000? It’s just a starting point. You can and will revisit. 3. Beg, Borrow, or Steal. There’s no shortage of “recommended” personal-finance goals and benchmarks out there. The only trick is not getting paralyzed by the volume of recommendations—or the different or even contradictory recommendations. For example, some say set a goal of saving 10-15% of your gross income. Some say you should be shooting higher. (Here’s a link to a Money article on 10% being a rule of thumb (though saying it’s too low) and to Yahoo! Answers on how much to save.) In the early stages, who cares? Pick the recommendation that feels right for you, for now. 4. Do A Little Better. After you have picked some early and maybe arbitrary goals and started working toward them—and developing some money habits—what next? Consider doing the math now. But if you’re not getting to that, you could also just set a goal of improving. Save more than last year. Save 10% more than last year. And so on. 5. Stretch Goals. Set goals, somewhat arbitrarily, that you look at and say—that’s going to be hard to do. Debt-free by 2010 (or whenever). Save 30% or 40% or more of your gross income—whatever will be uncomfortable. 6. “Big Hairy Audacious Goals (BHAG).” I learned of this term from the book, Built to Last. It’s described there as the vision of a company that is so simple—yet so lofty and aspirational—that it unifies and focuses everyone toward the goal. Often with a David versus Goliath spirit. For Ford, bring the automobile to the “multitude.” For Wal-Mart, a target of $130 billion at a time when the largest retailer in the world had only hit $30 billion—and the highest number that any company had hit was $125 billion (and that was General Motors). For personal finance? Financially independent by 50. Extreme early retirement. Money being a small enough concern that you can go do the job or career that you love or that has always been your dream. Some folks would categorize this more as “hopes and dreams”—and think it is so far removed from the concept of “SMART” goals that it’s not useful. I disagree. I think, with sufficient simplicity and clarity, a BHAG can be an important motivating force. Having goals is important. But they don’t need to be perfect. This is great... most people who want to get better at this stuff hate numbers. Very encouraging post! The basic idea (which makes a ton of sense): doing something is better than doing nothing. yup, Built to Last is a very good classic business book. I still haven't finished reading it, though. Yes, I do like the book -- though I actually read the later one first and like it better -- it's called Good to Great (I can't remember if it has both of the same authors or just Jim Collins). Great post. I think the key for me is just getting started! Action breeds more action, so getting started is the hardest part when it comes to planning for the future. People tend to wait when it comes to starting towards a long-term goal. LT or "big" goals require immediate action, but simply take longer to complete for one reason or another. Take the first step today! Thanks for the comment -- and I quite agree! Wow, I haven't heard BHAG for a long time. Good post. I’m very glad that a writer like you invests your time in a meaningful and useful way in which you share your knowledge with the people around you especially us bloggers. I will continue reading your post for it tackles different issues in our society that keeps me interested and go on reading the rest of your articles. This certain article talk about the current issues that is interesting in nature. I salute you for writing informative post and sharing your wisdom. Kudos!